HIV surveillance data helped health departments improve the HIV care continuum. JSI's role in providing tailored, intensive technical assistance to health departments has been instrumental in the Centers for Disease Control and Prevention’s launch of Data to Care, a promising new public health strategy to ensure continuous, high-quality care for people living with HIV. Data to Care uses HIV surveillance data to identify HIV-positive individuals who are not in care, link them to care, and improve performance along the stages of the HIV care continuum. It’s a new way of using data to inform program implementation and ultimately improve health outcomes. Develop data sharing agreements across HIV surveillance and other health data systems. Create not-in-care lists and matched them with other databases. Develop protocols for engaging persons not in care. Solicit community stakeholder input and feedback on proposed efforts. Evaluate efforts to engage and link persons to care. This project was particularly challenging and exciting for JSI because it was a relatively new approach—offering a way for HIV prevention, surveillance, and care teams to come together. The JSI team drew on its past capacity building delivery models to create new TA resources to support this initiative, and created more than 25 resources to support the health departments inimplementing their Data to Care plans. Additionally, JSI developed 18 general resources to be applied broadly across jurisdictions as other health departments begin to implement Data to Care programs. JSI's process was highly collaborative, including both the funder—CDC—and the health departments in setting the direction of the technical assistance at the start and throughout the project. Input from health departments that had implemented Data to Care activities in the past and the collaborative process with the CDC and health departments were essential to the project’s success, given the new intervention strategy. JSI also applied a tailored technical assistance approach to address individual states’ needs and varying starting points. Each of the seven states had its own policies and regulations, diverse client needs, and a unique set of local stakeholders and community requirements. Many of the health departments stated that without JSI’s customized TA, they would not have been able to start Data to Care activities so soon. 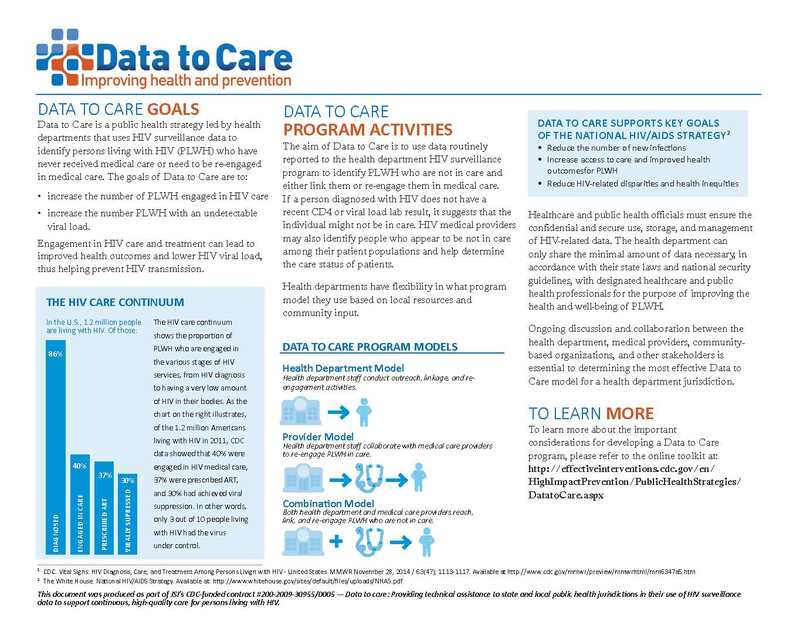 To learn more about the Data to Care Strategy, check out the Data to Care Overview or CDC’s Data to Care Toolkit.